A poached egg with a soft yolk serves as “instant” Hollandaise sauce for this single serving of grilled asparagus. Makes a lovely appetizer or vegetable side. My 10-year old palate never dreamed asparagus might be a delicacy. Mom grew it in her garden back home in Indiana, so we had plenty. Olive green and cooked till mushy, asparagus for dinner was reason enough to feign nausea and head for bed. Tired and bored of the same old asparagus? As an adult, I discovered a new appreciation for asparagus, and not just because I figured out how expensive it was in the store. After eating it grilled, I was smitten. While celebrating our anniversary at a nice restaurant recently, we were served freshly grilled asparagus with a soft poached egg on top. The waiter called it “instant Hollandaise.” Simple but sophisticated. I may be late to the party on this one, but I fell in love and wanted to share this easy recipe with you after last week’s multi-ingredient Cajun fest. To prepare bread crumbs, use a food processor or blender to tear a slice of stale bread into small pieces the size of oatmeal. Saute in a skillet over medium heat with enough butter to barely coat crumbs and give a nice crunchy brown crust. Lightly spray or brush asparagus with olive oil. Grill over medium-high heat until spears begin to turn bright green, turning once or twice as they cook. 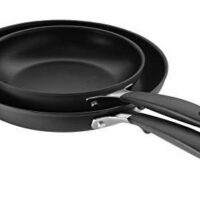 Can be done with a grill pan on the stove, an outdoor grill or even under a broiler. Remove to serving plate. Poach egg , leaving the yolk soft (see links at the end of this post if you aren't sure how to do this) and carefully place on top of asparagus. Sprinkle with salt and pepper to taste and top with toasted bread crumbs. My favorite way to poach an egg–silicone cups. Meanwhile, I will try the breadcrumbs! They look amazing! I LOVE your grilled asparagus and so does our mutual grandson! He ate 3 spears when I was last with him….Great recipe! 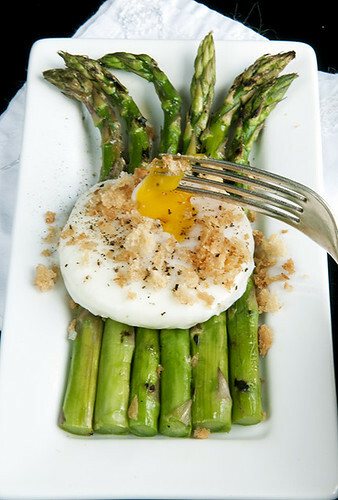 Eggs and asparagus both remind me of spring, and they’re a perfect pairing. 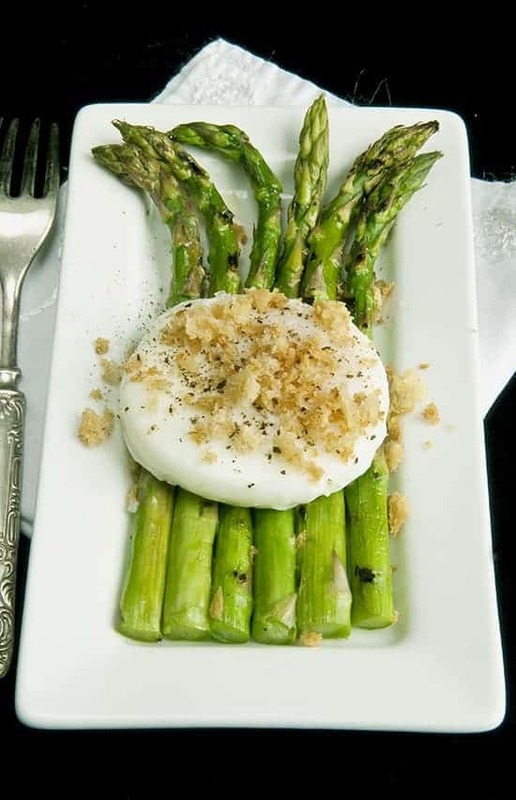 Your poached egg on asparagus is gorgeous! It won’t be too much longer before asparagus is ready. I love your little egg poachers- I think I need to invest in some of those! Looks great! Simple and elegant. Lovely! Such a simple yet sophisticated recipe, and a nice reminder that spring is on its way. I love your trick for poaching eggs – yours look perfect! Can’t wait for local asparagus to show up at the market. This looks just fabulous! What a great recipe and a beautiful photo. What gorgeous photos of this…wow. I come, I visit, I read, occasionally I comment, but I always always drool over your photos! 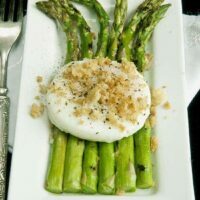 Love this recipe…so simple, so elegant, so nutritious, so on my list when that first fresh locally grown asparagus hits the markets! Looks wonderful! I can’t wait until the asparagus starts growing here… we still have about 6 inches of snow that needs to melt. Waiting on the Mason jar adapters to arrive to start with the salad- absolutely brilliant. Thanks for sharing. waiting on the mason jar adapters to arrive to start with the salad-brillint. I’m so glad to hear your yogurt turned out perfect. The cream of coconut is positively addicting. 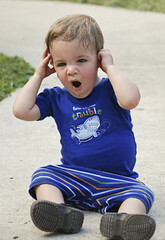 Enjoyed hearing about your other successes too. Thanks so much for writing. Love the combo as it is 2 of my favorites as well! Great picture. Asparagus looks perfect! Instant Hollandaise indeed! I hardly buy asparagus because it’s so expensive but I would splurge for this dish! (Heck, I would grow them for this dish!) And poaching eggs in silicone cups…brilliant! I have silicone cupcake “liners”–I think they are smaller than your baking cups but I’m going to try poaching eggs in them. 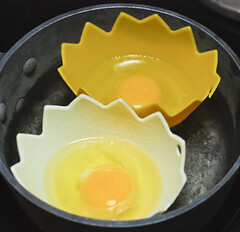 Silicone cupcake liners for eggs? You, my dear, are even more brilliant. Why didn’t I think of that. Great fun for kids. We have several things in common: that we started appreciating asparagus in the adulthood and that the place for such starting point took was a restaurant. Your proposal looks really attractive. I suggest you to try them topped by goat cheese and honey, and grilled too. You won’t repent! Sure! Goat cheese an honey? I never would have thought of that but how easy. Will definitely give it a try. Paula, here in Spain, goat cheese accompanied by sweet ingredients such as honey, caramelised onions or red peppers are some of the latest discoveries in gastronomy. If you make up your mind and try the combination, I beg you to tell me! I promise to get back to you, Yolanda. I’m going to try the honey and goat cheese first. What else besides asparagus? Paula, I have only tried the combination goat cheese, honey and asparagus. Here in Spain, we have the typical “tapas” or “pinchos” which are appetizers that we eat before the first dish on special occasions; they are also served in bars or restaurants. You can spread a little bit of goat cheese on a small loaf of bread, thinly cut and previously toasted, and topped by caramelised onion or red pepper. The result is delicious! Gorgeous, and your poached eggs are so perfect!